One reason natural gas investment prospects are better in North America than the rest of the world is that fracking (hydraulic fracturing of rock) is causing a bona fide natural gas boom right now. Most natural gas production in the United States comes from shale and tight gas; these are reserves of natural gas trapped deep in shale and sedimentary rock that are too hard to drill through. Fracking solves this problem by combining water, sand, and chemicals and injecting this mixture at high pressures to fracture the rock and release the gas. U.S. companies have perfected the fracking technique, allowing the U.S. to pass Russia as the world’s top natural gas producer. Fracking is now being pursued in many other countries around the world. 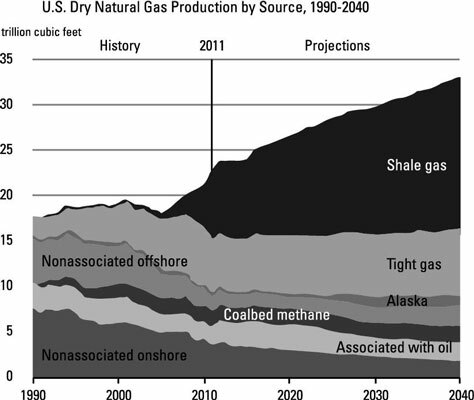 Although every other source of U.S. dry natural gas output is set to drop between now and 2040, production from shale and tight gas is projected to increase. Interestingly, many natural gas investors aren’t able to separate the two from each other. Tight gas: This source of natural gas is pretty much what it sounds like — deposits of natural gas trapped in a tight rock formation, typically sandstone or limestone, with little to no porosity. Shale gas: Shale gas is found in layers of sedimentary rock such as shale. Because the rock lacks the porosity to let the gas flow freely from the formation, companies combine horizontal drilling with hydraulic fracturing to make these plays commercially viable. Despite the added benefits and hype surrounding U.S. shale plays, it pays to keep a level head. Two major hurdles for shale companies to overcome are steep decline rates during the early life of wells in these formations and the exorbitant price tag that comes with each one. When you’re doing your due diligence when researching a prospective company focusing on shale gas production, always check to see how the company is dealing with these two major hurdles. Encana Corporation (NYSE: ECA), one of the leading natural gas producers in North America, shocked investors in February 2013 by announcing that it would actively drill the Haynesville shale in Louisiana. Encana was able to lower drilling costs by employing a new drilling method called multi-well pad drilling. It’s only a matter of months or years before multi-well pad drilling becomes the norm for shale plays throughout the United States. Companies using this technology, including Devon Energy (NYSE: DVN), are fast gaining an edge over the competition.